Volunteers picked up 500 pounds of trash from the sledding hill near Spooner Summit this year. A popular sledding destination in Lake Tahoe has become a persistent problem area for littering. 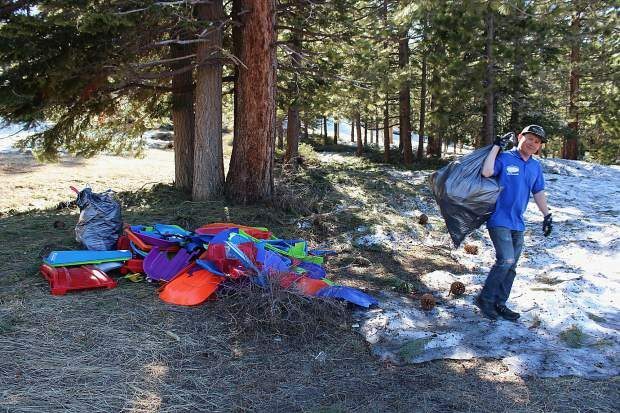 On Wednesday, May 3, volunteers and staff from The League to Save Lake Tahoe, Tahoe Regional Planning Agency, and Tahoe Fund came to clean up pieces of broken plastic sleds, discarded clothing items, food wrappers, diapers and beer bottles from the sledding hill near Spooner Summit. The Tahoe Resource Conservation District watercraft inspectors, who work out of the parking lot at the base of the hill starting in the spring, called the agencies to inform them of the unprecedented amount of garbage this year. In an hour and a half, the volunteers, in conjunction with the inspectors, collected 500 pounds of trash — 100 pounds of which were broken sleds. “Unfortunately, given this is such a popular sledding location for the public, we see this every year at the beginning of the season,” said Reed Dickert, who has worked three seasons at the inspection station. There are no dumpsters or trash cans at the area, which is not an official winter recreation area, but has become a hotspot for sledding. 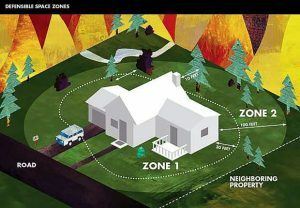 Marilee Movius, community engagement manger for the League to Save Lake Tahoe, said that the hill has been on the agency’s radar as a problem area for quite some time. “There is a sled corral with a ‘take care’ sign to remind people if they do have a broken sled to leave the pieces there. That was something that was tested for this season towards the end,” said Movius. Though some used this to dispose of broken sleds, there were still many plastic pieces of sleds collected by volunteers elsewhere. 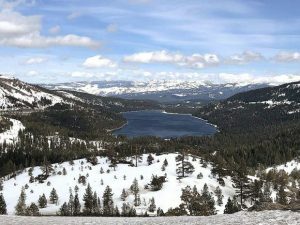 Heather Noel, spokeswoman for the U.S. Forest Service Lake Tahoe Basin Management Unit, said there are no plans to add a trash service to the sledding area. “As the current budget doesn’t account for trash service at every location around the basin, we rely heavily on the public to practice ‘leave no trace’ principles when recreating on the national forest,” said Noel. Last year, over 700 volunteers helped clean up beaches and recreation areas around the lake through the League to Save Lake Tahoe’s organized events. The League has a cleanup called the Tahoe Bike Challenge scheduled for June 17 in partnership with The Clean Tahoe Program, South Tahoe Refuse, Tahoe Regional Planning Agency, the Lake Tahoe Bike Coalition and Vail Epic Promise. “We are hosting three bike paths so people can ride their bikes and pick up litter from our neighborhoods and environment so it doesn’t make its way to the lake. At the end, we’re having a lunch celebration at the League office,” said Movius. The annual post-Fourth of July cleanup — Keep Tahoe Red, White and Blue — will be held on July 5 at beaches around the lake. “It’s really nice to see people that are dedicated to getting involved and being part of the solution,” said Movius.